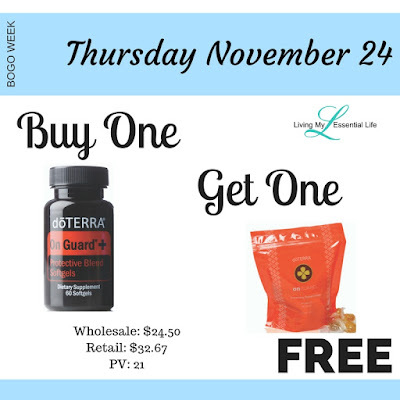 Starting Monday, November 21 and going until Friday November 25, we'll have a different BOGO each day of the week! 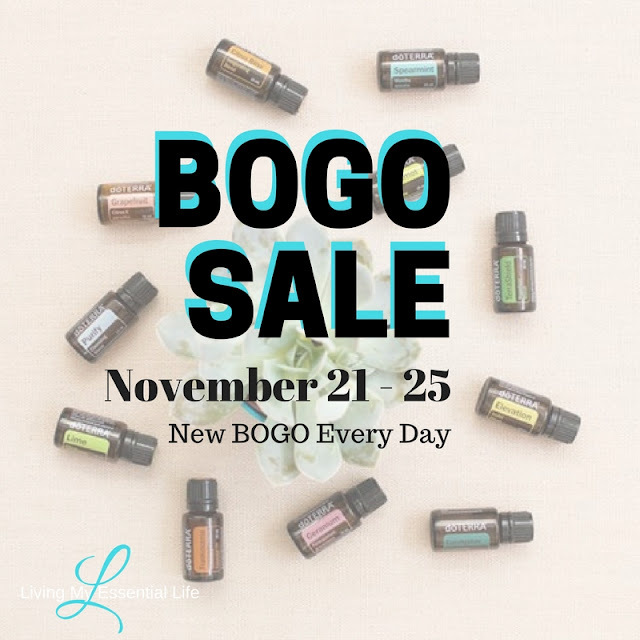 Join me each day for a unique BOGO each day, for a total of five specials for the week. 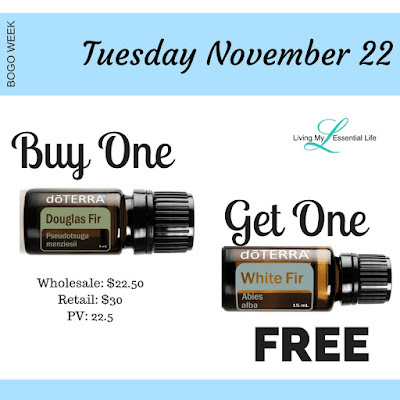 There is no obligation to "sign up" and you have 3 different ways in which to take advantage of these essential oils BOGO deals. They may even offer diffusers. What a fantastic Christmas gift. Current Wholesale Member Purchases: If you currently have a doTERRA wholesale account, you can purchase up to 5 BOGOs each day on your own! Log into your account and add the item to your cart. (Example: If the daily deal is buy Lavender, get a peppermint free, you would add the Lavender to your card and the peppermint will be added automatically.) Make sure to make it an LRP order because when you order more than 50 PV you can earn even more free products and all your shipping costs as well. Open a Wholesale Member Account: If you want to purchase your BOGOs at a discounted price, then you can enroll with your own wholesale member account for $35. This yearly fee can be waived if you enroll with an enrollment kit for even more savings! You will receive 25% off your current purchase and any future purchases for the next year. This allows you to go into your very own account and order what you want, when you want. You can earn free products too! I offer incentives for enrolling with me as well! So, you can earn even more FREE STUFF! 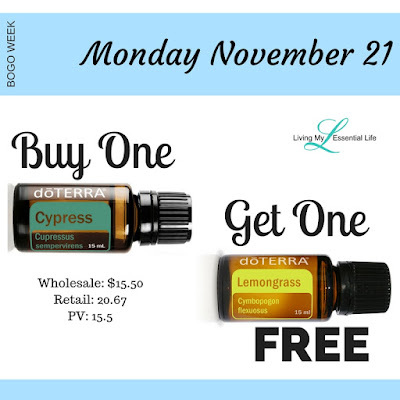 For each BOGO you purchase this week, you will be entered into a drawing for a FREE GIFT, including a keychain to hold your favorite oils, 3 rollerballs to make your own blends AND a WILD ORANGE essential oil! RSVP to this Event for all the details each day! We are offering a FREE GIFT each day to anyone who orders that day's BOGO! PLUS - at the end of the week there will be a drawing for FREE DIFFUSERS! Contact me to be added to the private event!!! Friday, Nov 25th: Sale ends at midnight (MST). 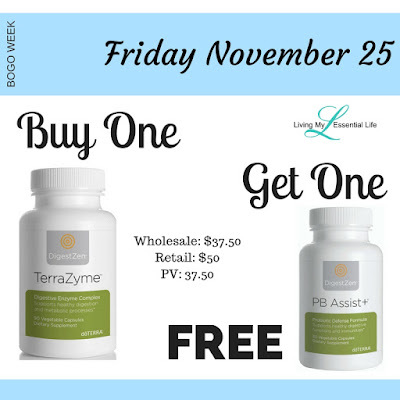 Buy 1 DigestZen TerraZyme™ and get PB Assist+® for FREE! Retail: Pay $50 +Tax/Ship for DigestZen TerraZyme and get free PB Assist+, a $46 value. Wholesale: Pay $37.50 +Tax/Ship for DigestZen TerraZyme and get free PB Assist+, a $34.50 value. DigestZen TerraZyme Digestive Enzyme Complex is a blend of whole-food enzymes and supporting cofactors that help strengthen the body's production of enzymes which is important in the process of healthy digestion of food nutrients and cellular metabolism of nutrients to energy. The powerful combination of digestive enzymes found in DigestZen TerraZyme supports the body’s constant production of enzymes critical for healthy biochemical functions, including healthy digestion of food nutrients and cellular metabolism of nutrients to energy. * DigestZen TerraZyme includes a variety of whole-food enzymes that help with the digestion of proteins, fats, complex carbohydrates, sugars, and fiber. PB Assist+ is a proprietary formula of pre-biotic fiber and probiotic microorganisms in a double-layer vegetable capsule. It delivers 6 billion CFUs of active probiotic cultures and soluble pre-biotic FOS (fructo-oligosaccharides) that encourage friendly bacterial growth. The time-release, double-capsule delivery system is designed to help protect the sensitive probiotic cultures from stomach acid. PB Assist+ offers a unique, safe, and effective way to deliver the well-recognized digestive and immune system support benefits of probiotics. Take one double-layer capsule three times daily with food for 10 days each month to promote colonization of friendly digestive flora. Can be used more frequently and for extended periods of time when digestive flora has been compromised by digestive stressors. PB Assist+ also may be used when traveling to boost digestive immunities, or once a day as an ongoing maintenance program for people with occasional digestive discomfort. Thursday, Nov 24th Only: Sale ends at midnight (MST). 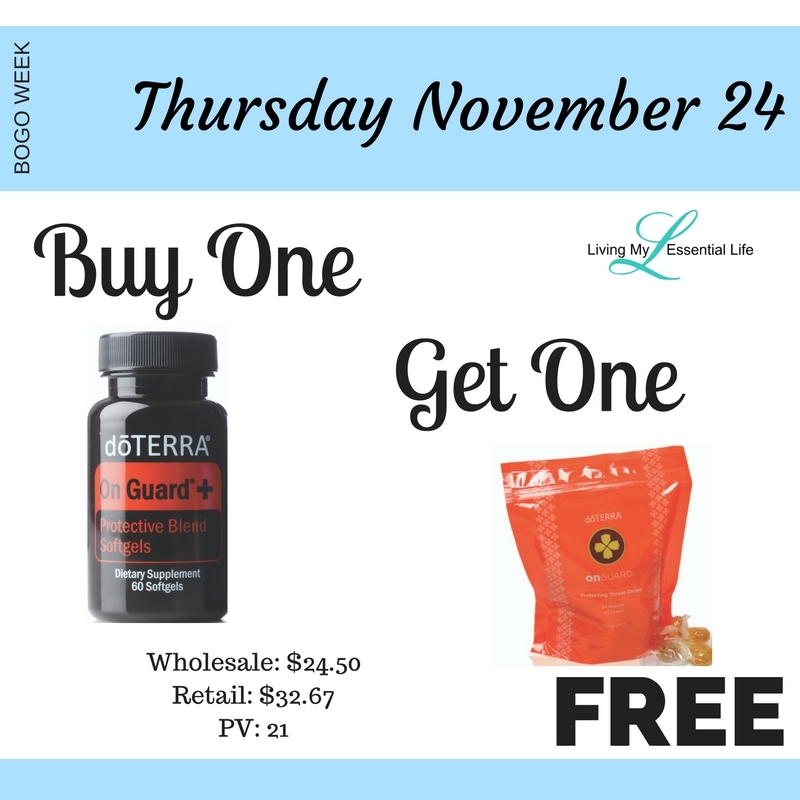 Buy 1 On Guard Softgels, Get 1 On Guard Throat Drops FREE. Retail: Pay $32.67 +Tax/Ship for On Guard Softgels and get free On Guard Throat Drops, a $19.33 value. Wholesale: Pay $24.50 +Tax/Ship for On Guard Softgels and get free On Guard Throat Drops, a $14.50 value. A MUST HAVE during the winter month! Encapsulated in vegetarian softgels, doTERRA On Guard+ contains essential oils known for their positive effects on the immune system, particularly when seasonal threats are high. doTERRA On Guard+ Softgels combine the proprietary blend of doTERRA On Guard Protective Blend with Black Pepper, Oregano, and Melissa essential oils for additional immune support. * doTERRA On Guard+ is a great way to strengthen and maintain healthy immune function when seasonal threats are high. * Encapsulated in vegetarian softgels, this distinctive blend contains essential oils known for their positive effects on the immune system and their ability to protect against environmental threats. * doTERRA On Guard+ should be taken on an occasional basis. Take one or more softgels as needed to promote healthy immune function. Wednesday, Nov 23nd Only: Sale ends at midnight (MST). 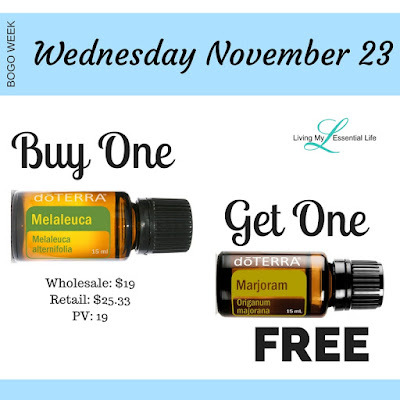 Buy 1 Melaleuca oil, Get 1 Marjoram oil FREE. Retail: Pay $25.33 +Tax/Ship for Melaleuca and get free Marjoram, a $25.33 value. Wholesale: Pay $19 +Tax/Ship for Melaleuca and get free Marjoram, a $19 value. Melaleuca, or Tea Tree oil, is best known for its purifying qualities, which make it useful for cleansing the skin and home surfaces, purifying the air, or promoting healthy immune function. Melaleuca is best known for its purifying properties. It can be used to cleanse and purify the skin and nails and to support a healthy complexion. Taken internally, Melaleuca promotes healthy immune function*, and Melaleuca can be used on surfaces throughout the home to protect against environmental threats. Melaleuca is frequently used on occasional skin irritations to soothe the skin and diffusing Melaleuca will help purify and freshen the air. With its calming properties and positive effect on the human immune and nervous systems, Marjoram was once known as a symbol of joy and happiness in ancient cultures. Also known as “wintersweet” or “joy of the mountains,” Marjoram was known to the Greeks and Romans as a symbol of happiness. Marjoram has been used in culinary dishes, imparting a unique flavor to soups, stews, dressings, and sauces: in Germany, this herb is known as the “Goose Herb” for its traditional use in roasting geese. In modern applications, Marjoram is valued for its calming properties and its positive effect on the nervous system. * It also supports both healthy cardiovascular and immune systems. Tuesday, Nov 22nd Only: Sale ends at midnight (MST). Buy 1 Douglas Fir oil, Get 1 White Fir oil FREE. Retail: Pay $30 +Tax/Ship for Douglas Fir and get free White Fir, a $26.67 value. Wholesale: Pay $22.50 +Tax/Ship for Douglas Fir and get free White Fir, a $20 value. Sourced from young trees in New Zealand, premium Douglas Fir oil can help promote feelings of clear airways during aromatic use, and cleanse the skin when used topically. This tall, evergreen fir tree is frequently used in the Christmas tree industry and has a lemonscented note that’s sweet and refreshing. Douglas Fir has a unique chemical composition that’s particularly rich in beta-pinene, contributing to its ability to promote feelings of clear airways. Douglas Fir can also be used to purify the skin and promote a positive mood. Blending Douglas Fir with citrus oils will create an uplifting environment while freshening the air. Used as building material and Christmas Trees, the white fir tree produces an essential oil that is known for evoking feelings of stability, energy, empowerment, and comfort. The white fir tree is a popular wood for construction because of its combination of strength, versatility, and beauty. It is also a popular choice for Christmas trees. Native Americans used white fir as a building material and in traditional health practices. Derived from the soft needles of the tree, White Fir essential oil is most noted for feelings of soothing comfort. Aromatically, White Fir evokes feelings of stability, energy, and empowerment. It can be stimulating to the senses while helping the body relax. Monday, Nov 21st Only: Sale ends at midnight (MST). 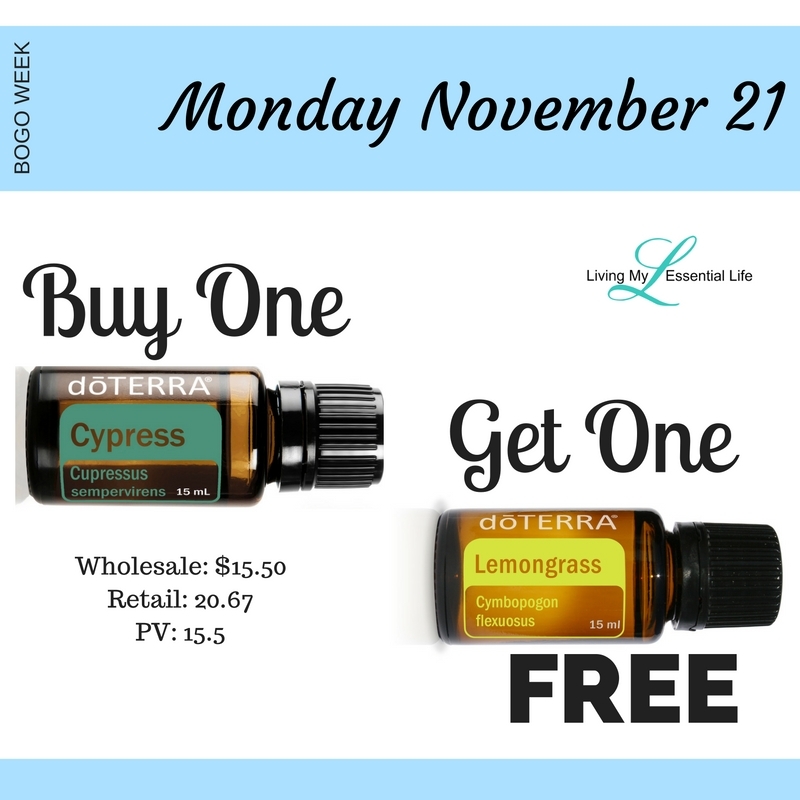 Buy 1 Cypress oil, Get 1 Lemongrass oil FREE. Retail: Pay $26.67 + Tax/Ship for Cypress and get free Lemongrass, a $13.33 value. Wholesale: Pay $15.50 + Tax/Ship for Cypress and get free Lemongrass, a $10 value. The clean, fresh aroma of Cypress essential oil promotes vitality and energy, while topical application helps to invigorate the senses. Derived from the branches of the tall evergreen tree, Cypress essential oil has a fresh, clean aroma that’s energizing and refreshing. Cypress is frequently used in spas and by massage therapists. Cypress can be diffused or inhaled directly, but should not be swallowed or taken internally. Cypress contains monoterpenes, making it beneficial for oily skin conditions. It has a grounding, yet stimulating effect on the emotions, making it a popular oil to diffuse during times of transition or loss. A favorite oil for massages, Lemongrass provides a pungent, smoky aroma, and offers purifying and toning benefits for the skin. Lemongrass has a subtle citrus flavor and is used in Asian cuisine in soups, teas, and curries as well as with fish, poultry, beef, and seafood. In addition to its unique flavor, Lemongrass essential oil promotes healthy digestion and acts as an overall tonic to the body’s systems. It’s also purifying and toning to the skin, and is frequently used in skin care products for these benefits. Lemongrass is an ideal oil to use in massage therapy. Lemongrass has a pungent, herbaceous aroma that can heighten awareness and promote a positive outlook.